Hello everyone, I'm so excited!!! My name is Buddy and some of you might know my mom -Dar from Peeking Between the Pages. When Wendy said I could come and guest post on her blog while she was away I was ecstatic! My mommy doesn't let me talk on her blog often - just on Sundays. I just love to be the center of attention and it was very nice of Riley to let me on his mom's blog too. I'm pretty jealous myself when it comes to my mom's attentions so I would understand if he said no. So I thought it might be nice to show myself off a bit and show some pics of me enjoying my very pampered puppy life. Yes I know I'm pampered and spoiled rotten but ssssshhhhhhh!! !, don't let mom find out! I don't want all this good life of rubs and treats and being catered after to end you know. Ok, first I want to talk about the fact that I hate baths. It's not fun getting put in that big huge tub. Yes mom comes in with me so I'm not as scared but I'm still going to milk it and get pity treats. A puppy's got to work the sad puppy eye angle all the time. When she does throw me in the tub though I get out after she's done and run into her room soaking wet and rub myself dry all over her bed. Yup, you bet - she hates it and gives me the what for but I pay no attention. Mostly I cause trouble at home. I love doing the couch olympics and running around and barking but every so often I like to just relax and curl up in the blankies. This is mommy's favorite time because she says she can finally relax and read her book without me being bad and distracting her. I know she loves it though cause I get lots of kisses and hugs; to be honest sometimes too many. I mean really how much kissing can a dog take before you just leave him alone! I'm not sure this qualifies as curling up in the blankies and resting though cause mommy was trying to fold this laundry but I was having fun. Now before I say good-bye, let's talk about the fact that I don't enjoy reading half as much as mommy does nor am I very fond of her doing too much of it. Why she insists on me reading a few pages is beyond me but if I pose nice I get a treat. Now I'm a smart dog. I know this, so I pose. She laughs, says good dog, and we head to my cupboard for that all important treat. Uggggh, she made me have a hair cut and a BATH for this picture too - not happy about that at all! I was however happy with all the treats I got! Photos courtesy of Dar from Peeking Between the Pages. Many thanks to Dar and Buddy for visiting Musings of a Bookish Kitty. Anya, Parker and Riley are wondering when they'll get their turn now. Be sure and drop visit Dar Peeking Between the Pages. If you don't already follow her blog regularly, you should! As always, Buddy looks so adorable! I think that is the most I've ever heard Buddy say! What a well-spoken doggy! Too cute! Ahh, the life of a literary dog, LOL! Oh, Buddy, you are just adorable! I am using the same bookmark as you are right now! Buddy says hello to everyone and thanks again for letting him post. He sure is enjoying all the attention focused squarely on him! I just love buddy...he is too cute and I think if he and Charlee hung out...there would be more trouble to be had! Ever thought of starting your own blog, Buddy? Buddy, you are adorable. I don't think there could be *too* much kissing and snorgling. Thanks for supporting me by using my bookmark, Buddy! You are adorable! You're a very cool dog but why must you dry off on your Mom's bed??? My dog Bruce TRIES to do the same thing. My question is why do you puppies insist on running around the house 100mph and rubbing against everything after we work so hard to get you clean???? Thanks everyone for all the wonderful ego boosting comments for me! I love them. Serena, I bet Charlee and me could really have a lot of fun driving you and mommy crazy! Jill, I have asked mommy for our own blog but she keeps saying no - very mean don't you think. Jennifer, I told mommy to put the bookmark on the page I was reading so everyone could see it and instead she left it in the pages. I will apologize for her. Staci, it's so much fun getting everything wet! Hello Buddy!!! Aunty Wendy is really cool to feature you and you're one eloquent goggie! "A puppy's got to work the sad puppy eye angle all the time" -- I laughed when I read this because it's so true with Hiro! I LOVED this post--especially, "I mean really how much kissing can a dog take before you just leave him alone!" 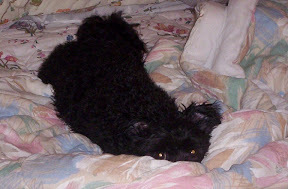 And Lexi my dog can't understand the aversion to baths--she loves her baths! Too bad her mommy doesn't like it because then she smells like wet dog. Yuck! Thanks Wendy and Dar for the fun! And thank you to everyone who dropped in to say hello to Buddy! Such a fun post! Thanks for stopping by, Buddy! Hi Buddy! I didn't realize how articulate you were. Sorry I didn't get to meet you when I was in your home town this summer. I had the privilege of meeting your mom though. Maybe next time we can meet. My Robbie hated baths too. We gave up and brought him to a groomer who was really good with him.